On June 30th, 2018, supporters of the Iranian opposition will descend on Paris. The city will host the annual convention of the National Council of Resistance of Iran (NCRI). Last year’s convention saw more than 100,000 regime opponents attend, among them were international politicians and officials within the US government. The NCRI is the only viable democratic alternative to the mullahs’ tyrannical regime in Iran. It is a political coalition, representing Iran’s diverse religious, ethnic and political groups, with proportionate representation (more than 50% of the NCRI’s membership is made up of women). The NCRI stands for democratic pluralism, universal suffrage and freedom of expression. It wants to end the systematic repression of the Iranian population and supports the abolition of the death penalty, nuclear disarmament, the establishment of an independent judicial system, and the separation of religion and state in government. The NCRI’s charismatic leader, President-elect, Maryam Rajavi, opposes and challenges the Iranian regime in all spheres of public life. 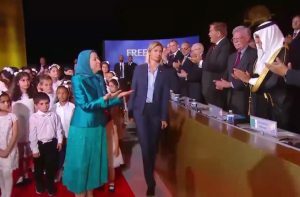 She publicly endorses public protests against the regime in Iran and has pressed for the regime to be held to account for its past crimes and atrocities. The regime’s efforts to discredit the NCRI are a testament to the strength of the organization. Tehran has spent millions of dollars on efforts to vilify the group and its leader, Maryam Rajavi, abroad. The mullahs see the NCRI and Rajavi as a threat to its existence. They have done everything in their power to prevent the organization from receiving international recognition. It has pressured international governments to demand restrictions on NCRI activities abroad. It also attempts to portray the organization as an obscure group of political exiles with little support inside Iran. In reality, the NCRI complies with all international obligations and UN-approved international conventions. 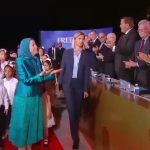 The regime also acknowledged the role of the NCRI and its subsidiary, the People’s Mujahedin Organisation of Iran (MEK), played in the recent uprisings across the country. In December and early January, public protests spread across Iran, quickly spreading across 140 cities and mobilizing Iranians from all sectors of the Iranian population. The protests, which were organized and endorsed by the NCRI and the MEK exposed the mullahs’ smear campaign against the NCRI as being blatantly false. The NCRI and MEK had mobilized swathes of the Iranian population. They evidently enjoyed widespread support from the Iranian people. The NCRI also already enjoys the support of the international community. Despite the regime’s best efforts, parliaments from several countries have endorsed the NCRI’s democratic goals and objectives. NCRI supporters include John Bolton, Donald Trump’s National Security Advisor, and Rudy Giuliani, former mayor of New York, among others. With public protests in Iran intensifying by the day, the mullahs’ position in power looks more precarious than ever. Should the people rise up and overthrow their tyrannical oppressors, the NCRI is the only democratic organization in the position to take over the governing of Iran. The NCRI has a plan for the country’s transition to democracy. Its ten-point plan outlines the country’s governing bodies and nominates a provisional government. It would act as a mechanism to prevent the country from descending into chaos and could maintain order and ensure a peaceful transition to democracy. The NCRI also has plans to establish Kurdish autonomy, provide religious and political freedom, and restore rights to women and ethnic minorities which have been cast aside by the clerical regime. These would address the pressing social and political issues that have caused the breakdown of social and political cohesion in Iran. The days of the clerical regime’s reign of tyranny are numbered. No organization enjoys the necessary domestic and international support to usher in Iran’s new democratic era like the NCRI. It has the authority and necessary foresight to preserve order and ensure a bright, prosperous, democratic future for Iran.